Plant & Food Research (Rangahau Ahumāra Kai) is a science company providing research and development that adds value to fruit, vegetable, crop and food products. Their Mt Albert site is the largest of the company’s 14 New Zealand locations and home to approximately 300 staff. As head office, the site contains a variety of different facilities, from laboratories through to office spaces. 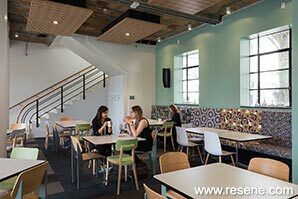 Plant & Food Research engaged Creative Spaces to design the interior for the Cunningham Building. The historic Art Deco building opened in 1939 is named after Gordon Cunningham one of the very first directors. It is the oldest building on site and sits in the centre of the campus. The existing building was deprived of spaces that encouraged interaction. This led to the conversion of the outmoded office and storage spaces into a new social hub, allowing staff collaboration and fusion in an optimal environment. Being a New Zealand government owned Crown Research Institute, the budget required careful consideration. The budget restrictions were a positive challenge, helping to keep the ideas concise and focused on the client’s needs. The renovations gave an opportunity to strip back the interior to its original structure, exposing ‘the bones of the building’. The ground floor is now home to an externally managed café, staff kitchen and collaborative meeting areas. Level one holds more formal meeting spaces and is connected to the main office building with a covered pedestrian bridge. The eclectic mix of modular furniture creates flexibility for social, formal meeting and dining areas. Recycled science cabinetry and equipment from old laboratories has been repurposed in new custom joinery units that divide the space creating different zones. Strategically placed pendant lighting and geometric motifs in the carpet tiles also define the mix of collaborative areas. The use of finishes and furnishings were influenced by the heritage of the building and history of Plant & Food Research. Off whites and pale greens were inspired by the Art Deco period, while archived photographs and illustrations of plants and organisms were the inspiration for the organic plants and cell-like patterned fabrics. The project started with reference to the Resene Heritage colour palette. Chlorophyll green colours, Resene Soft Mint (cool mint) and Resene Soft Apple (salad green) are feature colours on the south west walls of the ground floor, intentionally located to bring colour to the side of the interior that is overshadowed by the main office building. Resene Merino (green off-white) is used throughout to bring light to the space, while Resene Half Truffle (beige) highlights the intricacies, the ‘bones of the building’, such as the partition trims, rectilinear columns and architraves, components that emphasise the Art Deco period. Due to the large open plan spaces, high ceilings and high spec AV meeting rooms, specialised perforated timber acoustic panels were used as feature suspended ceilings and wall panelling. The warm timber finish, coated in Resene Aquaclear waterborne urethane, harmonised natural organic elements. On level one the use of feature colours captured more of a formal impression, emphasising the use of the space but still in keeping with the heritage colour palette and Plant & Food Research brand. Resene Envy (watery green) was chosen for the larger meeting room kitchenette alcove walls and glass splashbacks, creating pockets of freshness in each meeting room. The AV meeting rooms required a conservative, darker colour, Resene Timekeeper (blue green), to the walls and acoustic panelling, allowing visual ease in the backdrop when users are in an AV meeting. When exposing the bones of the Cunningham and removing the old ceiling tile and grid it was expected to find a concrete slab. Instead the unexpected outcome of the beautiful exposed brick floor tiles of level one became the ceiling feature for the ground floor, an element that ‘money can’t buy’. The large Plant & Food Research mural, painted by James Turkington in 1939, hangs on level one and was restored by the Auckland Art Gallery prior to the completion of the project. The mural features many colours that are present in the Resene Heritage Palette, complementing the interior space and establishing a sense of belonging for the mural to be back in its original interior space. Walls throughout are finished in Resene Zylone Sheen low sheen and wet areas in Resene SpaceCote Low Sheen Kitchen & Bathroom with trims and joinery throughout in Resene Lustacryl semi-gloss waterborne enamel. 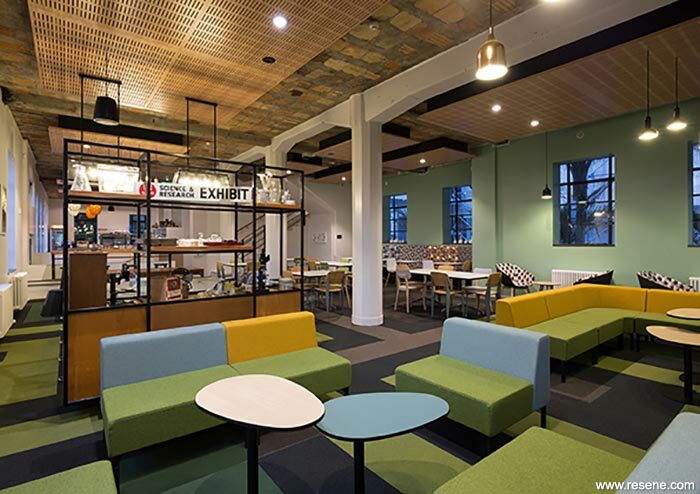 The buzzing culture of the café hub has converted the Cunningham from being a dull office space into a lively wellbeing work environment – it truly has become ‘the heart’ of the campus. This Plant & Food Research office by Creative Spaces won the Resene Commercial Interior Office Award 2016. The judges thought “relaxed and fun, this office represents the business it houses through its colours and materials. There is a sense of balancing a sympathetic colour palette in keeping with the heritage of the building while bringing the beauty of nature indoors in a softened colour palette.